The Robin Hood Tax (RHT) Financial Transaction Tax (FTT) is a proposed act intended to target the financial sector by implementing a diminutive transaction tax of 0.1% or 0.05% on the trading of bonds, shares and derivatives. This tax has the potential to raise up to €360 million annually and is intended to be used to fight poverty and the environmental crisis in Ireland and abroad. 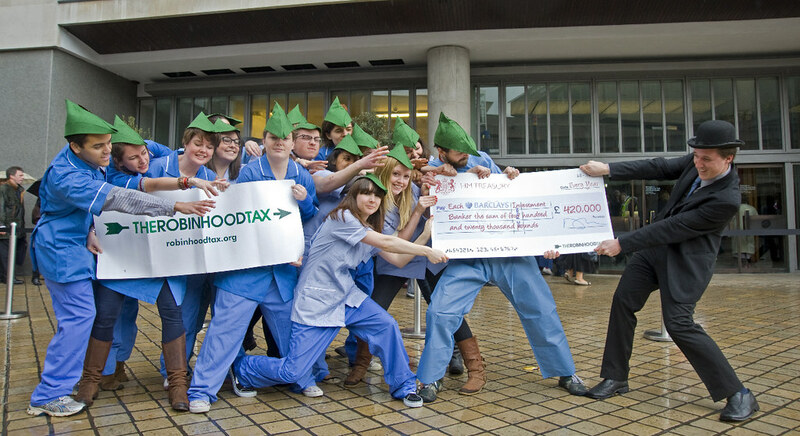 The Robin Hood Tax is specifically aimed at casino-style trading. The tax is an evolution of J.M Keynes and Tobin tax ideas intended to curtail the trading of big banks in the highly speculative volatile markets. The primary customer-base of these types of trading activities, being hedge funds and investment banks are comprised mostly of high net worth individuals. The tax will be applicable to hedge funds, investment banking divisions of large banks, and dedicated investment banks who partake in this trading, essentially the wealthiest sector of Ireland’s GDP. So far, only ten member states have decided to introduce the act. The Nevin Economic Research Institute (NERI) claimed that the RHT will boost the economy with the creation of 9,250 jobs through the investment in infrastructure, tax cuts and the increase in public services. 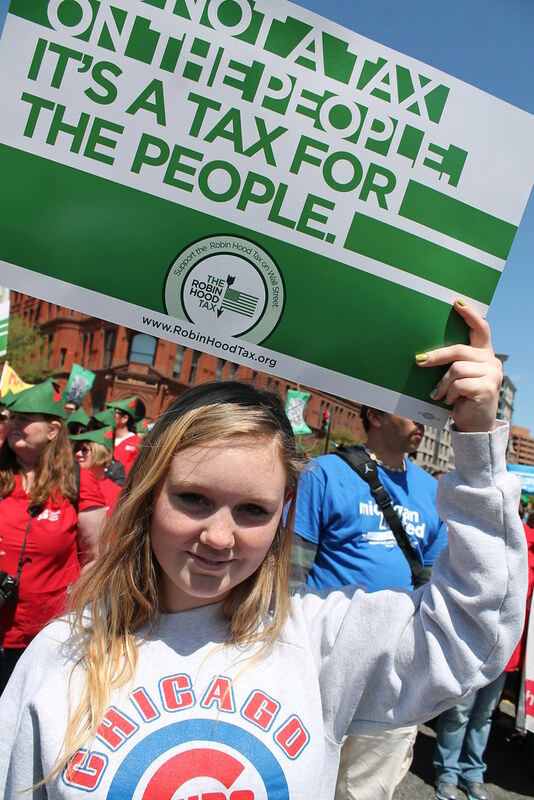 Recently, many trade unions, civil society organisations, global justice organisations and environmental organisations have unified to promote the message that this tax offers the opportunity to create jobs and tax big banks. For example, Claiming Our Future organised the launch of the RHT yesterday with the intention to create national awareness and highlight its possible benefits. The NERI study will be launched on the 10th February 2016, which will look at the financial trades that amass €2,666 billion a year in Ireland alone. However, unlike France and Germany – who are at the forefront of pushing this tax through the EU – Ireland’s major parties have shown little to no interest in its introduction. For example, many citizens are unaware that one of the many future benefits of the RHT would be the abolishment of the stamp duty. It is much more desirable for the majority of the population to welcome this sourcing of revenue, which targets wealthy financial sector participants, as opposed to the VAT, which disproportionately taxes even the poorest people. It is noteworthy to classify this tax in the same stream as that of taxing capital gains. the International Monetary Fund (IMF) agrees with this perspective from their most recent study, concluding that this tax in all likelihood would be ‘highly progressive’. The Robin Hood Tax is a FTT cheap to implement and difficult to avoid, while various nations have decided to implement different transaction taxes. The principle is to tax a minimal amount which will not act as an incentive for banks to leave. The growth of derivatives and high frequency trading subsequently has swelled the markets. The derivatives market has increased to more than 70 times the size of the world economy amounting to approximately $640 Trillion in 2012. The 10 member states who have committed to introducing the RHT through “enhanced co-operation” will be finalised by June 2016 with the first taxes being collected in 2017. The only parties which have included their stance on the RHT in their campaign manifestos are the Green Part and People Before Profit. Easy things you can do to be involved!